You go to the Intel Developer Forum to learn. You learn about Intel’s heading, new technology and knowledge from other attendees. Unlike trade-shows where you’ll be talking to marketing teams and show-floor assistance, you get to hear from expert engineers, product managers and technologists. Thanks to Intels support at IDF I was able to sit down for a one-to-one with Adam King, senior manager responsible for the Ultrabook sector and get some outstanding questions answered. In my 30 minutes with Adam I fired off a set of questions that I’ve had written down since I started planning for IDF. I started with marketing and asked Adam what marketing help Intel would be giving to retailers and OEMs. What I got was a response shocked me. Most of Intels brand marketing spend will be on the Ultrabook. To repeat, more than 50% of Intels marketing money is going towards the Ultrabook. Think advertising, in-store marketing, online marketing, and event support. Consider that Intel cover segments ranging from tablets to servers including netbook, laptops, desktops, SSD’s and a huge range of software activities and you get a feeling for how significant this is. 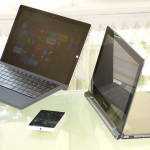 What shouldn’t be a surprise is the information that Ultrabooks are initially targeted at mature markets. With tablets largely non-existant in developing countries, netbooks are still important there and the luxury of style and design is largely unnecessary. Even mobility tends to he a luxury so the shared desktop PC and Netbook remains important there. That desktop could be at risk in other markets though. As desktops draw near to replacement, Ultrabooks may become a choice that cuts across desktops. Replacing storage with the cloud and the NAS and a Thunderbolt docking station or Wi-Di setup could be a more exciting proposition for some than buying a new desktop PC. Intel agree that this scenario is possible. I suggest that desktop upgrade cycles will be lengthened in developed markets. Intel don’t have any detailed response to my suggestion other than saying that developed markets will continue to see multiple computing purchases. I wanted to lock-down once and for all, the features of an Ultrabook so I asked. “thin, responsive and secure” is not the answer I was looking for so I dived deeper and asked about all Ultrabook features. Anti-Theft and Identity Theft protection, it seems, can be guaranteed as a feature of all Ultrabooks. Others, outside Intel, have said it will be unique to Ultrabooks but that is not the case right now, says Intel. This is the reason that the Samsung Series 9 laptops are not Ultrabooks. Rapid start is guaranteed although It doesn’t necessarily need to be Intel’s solution. Wi-Di (and wireless audio) is not due to specific Wi-Fi module requirements. This is left as a differentiation option for the OEMS. Quick-Sync Video is guaranteed but only if the Intel HD graphics solution is used. It’s been confirmed that discreet graphics are an option for Ultrabooks, as are switchable graphics solutions. Turbo features of the Core CPU platform are not guaranteed as the Core i3 platform doesn’t implement this feature. We talk around other tablet-like features and I suggest that GPS support is needed in the core of the device to enable rich social networking applications. 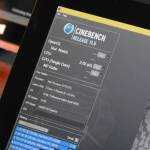 I suggest that the Intel Appup application store may have a role to play in the Ultrabook too. Intel see the need for sensor support and they “envision” enabling sensors in the future. For me that means Windows 8. On the use of Appup as an app store I didn’t get a clear response. AppUp is currently “not a requirement.” Interestingly, we see an Ultrabook session scheduled for the next Appup event. Clearly this is something that Appup is looking at for the future. Sticking with Ultrabook futures I ask about new form factors and ask whether Ultrabooks could move to smaller screen sizes. For 2012 Intel expect 11″-15″ screens but I apologise, reader, because its a dumb question. Of course smaller screen sizes will be possible as the platform power, size and heat requirements reduce. It’s up to the OEMs to use Haswell in whatever way they see fit. If its not coming under the Ultrabook brand, it will naturally be called something else. A 700gm Haswell Ultraslate is more than possible. Finally we talk about the 300 million dollar fund. I’m hoping to get an update but its too early for anything on that. You’re looking at a wide feature-set in the Ultrabook. Boiling it down to final specs and features is almost impossible especially as the feature-set will evolve in the future. ‘Thin, Responsive and Secure’ leaves OEMs with open-ended pricing options and therefore, varying feature sets. To have success in Ultrabooks without tightly defining what an Ultrabook is does require a leap of faith from customers but maybe that’s what the marketing fund is all about – securing the confidence of consumers. Don’t worry though, we won’t let you get blinded by marketing. The Ultrabooknews product database is here to help tout make that choice. Based on the fuzzy definition we’ve decided to enhance the database. Expect to see an Ultrabook feature list added to all Ultrabook product pages soon. 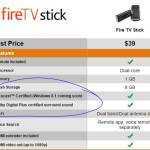 Coming soon: Amazon Fire TV Stick + Windows 8.1 Miracast support. « Samsung Galaxy Note to Come with 4G LTE, on AT&T?